Highland Wear can be worn for all occasions. There is the traditional look and the contemporary look, and the Jacobite look. 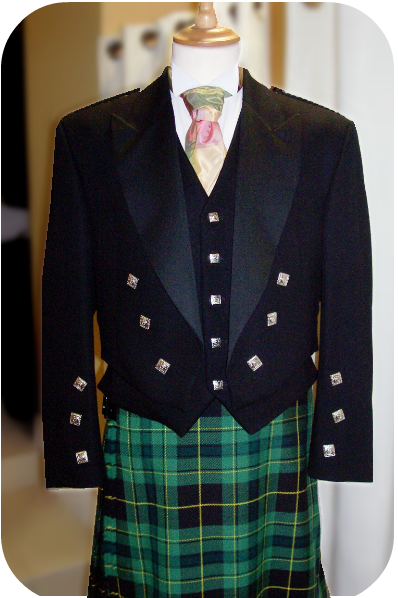 The traditional look is the your kilt, Prince Charlie jacket and 3 button waistcoat, white shirt and black bow tie, cream hose and ghillie brogues. Your contemporary look is your kilt, morning jacket 5 button waistcoat with your white shirt and rouche tie in the colour of your choice,( if your wearing a black kilt you would wear black hose) ghillie brogues as standard. The jacobite look is a stricking alternative to traditional and contemporary look. This outfit comprises of navy jacobite waistcoat, ghillie shirt, kilt in the tartan of your choice, semi dress sporran, belt, cream hose and ghillie brogues. This opened neck shirt is ideal for weddings abroad, or if the groom would like to change into something more comfortable for the evening reception.